Karl Robinson said he feels betrayed by Rob Hall after the winger signed for Oxford. 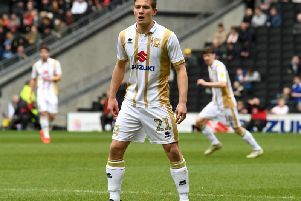 The Dons boss agreed a one-year deal to remain at Stadium MK with Hall, who is still out for another five months recovering from a cruciate ligament operation. But Oxford’s late bid for the player turned his head, and left a sour taste in Robinson’s mouth. “I was absolutely gutted,” said Robinson. “He’d verbally agreed a deal with me and a number of other people in a room, we were told his Bolton contract wasn’t up until the end of the month so there was no hurry to get it done. “When you put four months into somebody, to be treated like that has left a really bitter taste in my mouth. “We felt that for someone with a cruciate injury, a one year deal was sufficient. “Our insurance paid for his operation, my medical staff were in all summer with him. “He’s the only injured player we had at the club, and they were in just for him. “His agent also represents Diego Poyet, Jordan Spence, Sergio Aguza and Cristian Benavente. We’ve worked very closely with that agent, and he was someone I considered a friend. It’s disappointing.